Propolis is an important bee product, used by the bees to seal the cracks and to hygiene the wax combs after brood rearing (Huang et al., 2014). The bioactive compounds of propolis originate from plant resins that bees collect, mix with own secretions and wax. Propolis chemical composition is different according to the geographical location (Mărghitaş et al., 2013), botanical origin and bee specie (Silici and Kutluca, 2005). The aim of the study was to determine the chemical composition of different propolis samples from Romania and Turkey and to correlate the composition with the antioxidant and antibacterial activity of tinctures against Gram-positive and Gram-negative bacteria. Soxhlet extraction, gravimetric measurements, spectrophotometric and chromatographic determinations were used in the study. The antimicrobial properties were evaluated in vitro towards both reference and clinical strains of Staphylococcus aureus, Salmonella enteritis, Salmonella typhimurium, Escherichia coli and Pseudomonas aeruginosa using the disc diffusion assay; the minimum inhibitory (MIC) and minimum bactericidal (MBC) concentrations were established by a broth microdilution method and used to calculate the bactericidal index for each extract. The wax content of the samples ranged within the limits provided by the Argentinian and European standards in effect. Balsam content of the samples was above 30%, providing a tincture with high antioxidant properties. High amounts of total polyphenols and flavonoids were determined in all samples, though different for Romanian and Turkish samples. The inhibitory ability was different for samples coming from different geographical origins, depending fundamentally on plant source resins, but also on bacterial species. 1 Marghitas LA, Dezmirean DS, Bobis O (2013) Important developments in Romanian propolis research. Evidence-Based Complementary and Alternative Medicine 2013: 159392. 2 Huang MI, Zhang C-P, Wang K, Li GQ, Hu FL (2014) Recent advances in the chemical composition of propolis. Molecules 19: 19610-19632. 3 Silici S, Kutluca S (2005) Chemical composition and antibacterial activity of propolis collected by three different races of honeybees in the same region. Journal of Ethnopharmacology 99: 69-73. ISNAD BOBIS, Otilia , KESKIN, Merve , KESKIN, Saban , KOLAYLI, Sevgi , NICULAE, Mihaela , URCAN, Adriana , PASCA, Claudia , MĂRGHITAS, Liviu Al. , DEZMIREAN, Daniel S. . "Propolis from Romania and Turkey: Comparative Antioxidant and Antibacterial Activity". 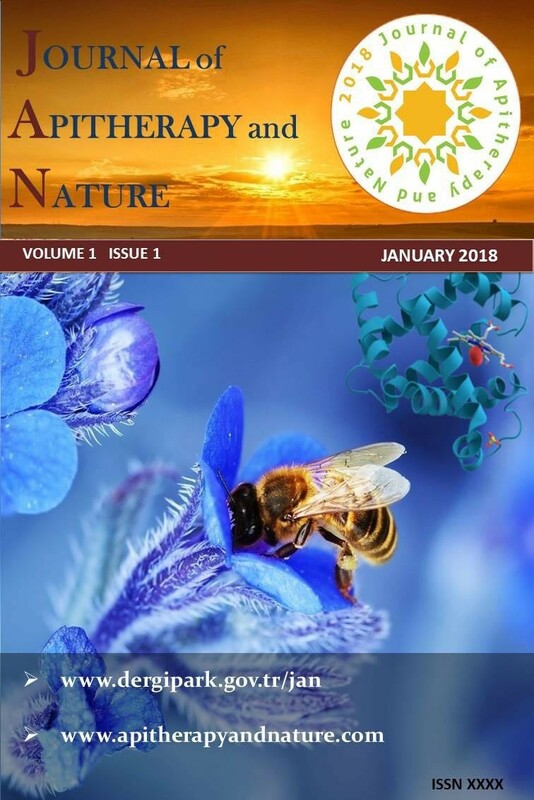 Journal of Apitherapy and Nature 1 / 3 (December 2018): 38-38.